From the New Words section (1939) of Webster's New Internaitonal Dictionary, 2nd ed. Pneumonoultramicroscopicsilicovolcanokoniosis succeeded electrophotomicrographically as the longest word in the English language recognized by the National Puzzlers' League at the opening session of the organization's 103d semi-annual meeting held yesterday at the Hotel New Yorker. The word appears in the New Words section of W2 on a page which has a copyright date of 1939 (spelled -koniosis), W3 (spelled -coniosis), OED2, RHUD2, and Chambers. 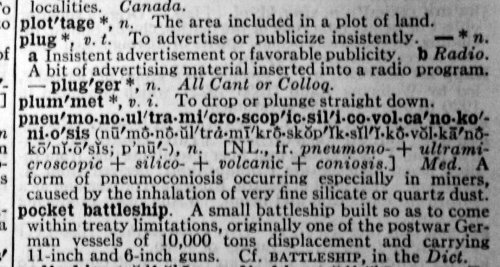 pneumonoultramicroscopicsilicovolcanoconiosis (-koniosis), a factitious word alleged to mean 'a lung disease caused by the inhalation of very fine silica dust' but occurring chiefly as an instance of a very long word. 1966 Word Study Oct. 7/2 The resources of Greek have enriched the modern world as well as the ancient one. Perhaps this is most dramatically illustrated by the longest and most fantastic word now in an English dictionary (the Merriam-Webster's great Unabridged) which is forty-five letters in length: pneumonoultramicroscopicsilicovolcanoconiosis,..meaning 'a disease of the lungs caused by extremely small particles of ash and dust'. 1973 R. Megarry Second Miscellany-at-Law 160 It has been said that 'floccinaucinihilipilification' is the longest word in the English language... The word's proud title must yield to some technical terms, such as pneumonoultramicroscopicsilicovolcanokoniosis. I conjecture that this "word" was coined by word puzzlers, who then worked assiduously to get it into the major unabridged dictionaries (perhaps with a wink from the editors?) to put an end to the endless squabbling about what is the longest word. The domain name Iamtheproudownerofthelongestlongestlongestdomainnameinthisworld.com may be the longest domain name. In 2005 the web page at this address states, "This record cannot be broken with a .com domain, because 63 letters is the maximum number of letters that can be registered as a domain name. Owner of the Longest Domain Name in this World : Dr. Subrahmanyam Karuturi"
HEPATICOCHOLANGIOCHOLECYSTENTEROSTOMIES (39 letters; surgical creation of a connection between the gall bladder and a hepatic duct and between the intestine and the gall bladder) is the longest word in Gould's Medical Dictionary. PSEUDOPSEUDOHYPOPARATHYROIDISM (30 letters) is defined in the OED2 as "a familial disorder in which the skeletal and developmental abnormalities of pseudohypoparathyroidism are present without the biochemical abnormalities common to hypoparathyroidism and pseudohypoparathyroidism" [Philip Bennett]. Floccinaucinihilipilification!! It means 'the estimation of something as valueless'! You've been randomly reading th' dictionary, haven't you? Floccinaucinihilipilification was also used by Press Secretary Mike McCurry in his December 6, 1995, White House Press Briefing in discussing Congressional Budget Office estimates and assumptions: "But if you—as a practical matter of estimating the economy, the difference is not great. There's a little bit of floccinaucinihilipilification going on here." The 1992 Guinness Book of World Records calls floccinaucinihilipilification "the longest real word in the Oxford English Dictionary," whereas it calls pneumonoultramicroscopicsilicovolcanoconiosis "the longest made-up word in the Oxford English Dictionary." The Merriam-Webster website in 2002 stated that floccinaucinihilipilification "is not in any of the Merriam-Webster dictionaries because our evidence shows us that it is ... almost always used simply as an example of a long word." ANTIDISESTABLISHMENTARIANISM (28 letters) may be the best-known long word. The word means "the belief which opposes removing the tie between church and state." PARADIMETHYLAMINOBENZALDEHYDE (29 letters) is the name of a chemical substance and is found on several Internet web pages [Richard Eisenberger]. Isaac Asimov, in an essay titled "You, Too, Can Speak Gaelic," points out that the word can be sung to the tune of The Irish Washerwoman, the best-known Irish jig. The essay is about understanding chemical nomenclature [Mark Brader]. Both W1 and W2, which include every word used by Shakespeare, define the word as "honorableness" and label it a "pedantic nonsense word." It is the ablative plural of the Latin contrived honorificabilitudinitas, which is an extension of honorificabilis meaning "honorableness." It first occurs in English in 1599, used by Thomas Nashe. The letters can be rearranged to give "Hi ludi F. Baconis nati tuiti orbi," meaning, "These plays, F. Bacon's offspring, are preserved for the world." This fact has been cited by proponents of the theory that Francis Bacon actually wrote Shakespeare's plays. The word has alternating vowels and consonants. INTERNATIONALIZATION (or INTERNATIONALISATION) has a common abbreviation among computer people based on its length: I18N or i18n, i.e. there are 18 letters omitted [Mark Brader]. CYSTOURETEROPYELONEPHRITIS (26 letters; a combined inflammation of the urinary bladder, ureters, and kidneys) is a long medical term mentioned by Paul Hellweg in The Insomniac's Dictionary. DISPROPORTIONABLENESS and INCOMPREHENSIBILITIES (21 letters) are described by the 1992 Guinness Book of World Records as "the longest words in common use." The following two tables showing the longest words occurring on on-line English dictionaries were compiled in March 2007 by Philip C. Bennett of Belfast, N. Ireland. He provides the following notes: 1. No geographical place names, personal names or product names are listed. 2. No foreign language words, such as German or Greek etc, are listed. 3. Certain nouns, which could have plural extensions added, such as "s" "es" or "ies", have not been listed. Only when the dictionary displays the noun with its plural ending is such a word listed. 4. Most of the long words are either chemical or medical in nature, and are rarely used in everyday speech. 5. No hyphenated words have been listed. 6. No multi-word phrases have been listed. 7. All the words listed do occur in their respective dictionaries; most times as definitions; sometimes as etymology quotations or citations to assist the meaning of another word definition. In the following list, MWUD = Merriam-Webster Unabridged Dictionary; OED2000+ = Oxford English Dictionary - New 2000+ Edition; OLMD = The Online Medical Dictionary 2007; Dorland = Dorland's Illustrated Medical Dictionary 2007; Weisstein = Eric Weisstein's World of Mathematics. In Spanish, SUPEREXTRAORDINARISIMO is the longest word according to Guinness 1995. However, the legitimacy of this word is open to dispute. Nidia Cobiella points out that there are numerous similarly-formed questionable words, such as superextraordinariamente, superespectacularisimo, otorrinolaringologistico, endocrinologicamente, apesadumbradisimamente, descontaminadamente, requeterequeteacostumbrado, sobreabundantisimamente, superimaginariamente, superexcelentisimamente, superpsicoanalisticamente, and desconsideradisimamente. YODOCLORHIDROXIQUINOLEINA (25 letters) appears in Diccionario de Medicina (this dictionary has not been searched and may contain longer words). SUPERCALIFRAGILISTICOESPIALIDOSO (from Mary Poppins) has also been suggested. The legitimate words OTORRINOLARINGOLOGIA and OTORRINOLARINGOLOGO could also lead to superotorrinolaringologo and superotorrinolaringologisimo. Other suggestions for the longest word in Spanish are ESTERNOCLEIDOMASTOIDEO (22 letters, a neck muscle), ANTICONSTITUCIONALMENTE (23 letters, unconstitutionally), and ELECTROENCEFALOGRAFISTA (23 letters, electroencephalograph technician). In Lithuanian, NEBEPASIKISKIAKOPUSTELIAUJANCIUOSIUOSE (38 letters) is possibly the longest word that can be formed according to legal grammatical rules (so it can't be regarded as completely coined). It means "in those, of masculine gender, who aren't gathering wood sorrel by themselves anymore." The meaning is obscure but possible, e.g. in a fairy tale about hares: "A terrible hunger arose in the [long word] hares" [Juozas Rimas]. Vilius Puidokas provides a slightly longer version of this Lithuanian word: NEBEPRISIKISKIAKOPUSTELIAUJANCIUOSIUOSE (39 letters), meaning "in those, of masculine gender, who aren't gathering enough wood sorrel by themselves anymore." He says the fairy tale use could be the same. Andrius Stasauskas provides an even longer version of the word: NEBEPRISIKISKIAKOPUSTLAPIAUJANCIUOSIUOSE (40 letters), meaning "in those, of masculine gender, who aren't gathering enough wood sorrel's leaves by themselves anymore." He reports that the word will appear in his upcoming book about the lives of ants, Ridas. Kankorezis (in English, Rid. The Cone). In Portuguese, INCONSTITUCIONALISSIMAMENTE (27 letters) is the longest word. It means "very unconstitutionally" [Carlos Andre Branco]. In Croatian, PRIJESTOLONASLIJEDNIKOVICA (26 letters) is a word meaning "the wife of a heir to the throne" [Vjekoslav Babic]. In Russian, the longest word is RYENTGYENOELYEKTROKARDIOGRAFICHYESKOGO (33 Cyrillic letters, 38 Roman), "of the X-ray electrocardiographic," according to 1996 Guinness. According to Ilya Morozov, the longest Russian common noun is VODOGRYAZETORPHOPARAPHINOLECHENIE (29 Cyrillic, 33 Roman). It means "a medical treatment with use of water, ooze, peat and paraffin." Another long Russian word is ZAGIPNOTIZIROVAVSHEMUSYA (22 letters), meaning "to him who has hypnotized himself" [Pierre Abbat]. Regarding this word, Ilya Morozov writes, "This is a verbal adverb, not a noun. It is very important: in the overwhelming majority of Russian word-puzzles only nouns can be used. Therefore, most Russian computer programs for word searching contain only noun lists." In Turkish, ÇEKOSLOVAKYALILASTIRAMADIKLARIMIZDANMISINIZ (43 letters, 18 syllables) is usually cited as the longest word. It translates as "are you one of the people whom we couldn't Czechoslovakianize (i.e. make into a Czechoslovakian)"? However, the last seven letters are usually printed as a separate word [Edward Sawyer]. The following discussion on long Turkish words is from Fatih Aygün: In Turkish Çekoslavakyalilastiramadiklarimizdan miymissiniz (47) is traditonaly cited as the longest Turkish word, but the last 11 letters are written separately. It is counted as a single word because the separate part is a suffix. The word means "Were you amongst the ones that we couldn't make a Czechoslovakia citizen?" If we want a word without spaces, we have Çekoslavakyalilastiramadiklarimizdanmissiniz (44). That means "apparently you were amongst the ones that we couldn't make a Czechoslovakia citizen." But there are longer place names than Çekoslavakya. Afyonkarahisar, a province of Turkey, is the first I came up with. Afyonkarahisarlilastiramadiklarimizdanmissiniz (46) has a similar meaning, just replace Czechoslovakia with Afyonkarahisar. In fact, the conjugation template can be a bit more complicated. Afyonkarahisarlilastiramayabileceklerimizdenmissiniz (52) means "apparently you may be amongst the ones that we will not be able to make a Afyonkarahisar citizen." The longest unconjugated word in the TDK dictionary (TDK = Turkish Language Foundation, official regulator of the Turkish language) is elektroansefalografi (20), which means "electroencephalography." So we can invent a longer conjugated word: elektroansefalografililestiremeyebileceklerimizdenmissiniz (58), which means "apparently you may be amongst the ones that we will not be able to make have an electroencephalography." I systematically searched the online version of the TDK dictionary and conjugation suffixes. So I think that a longer word cannot be invented unless a longer word stem is invented. NAJNEOBHOSPODAROVAVATELNEJSIEHO (31 letters) is the longest Slovak word, according to Miroslav Sedivy, who reports it means "of the less cultivable" (about a field). According to Jacek Drobnik, the longest real word in Polish, which is neither an intentionally mounted oddity nor a surname nor a chemical name, is NAJCHARAKTERYSTYCZNIEJSZEGO, the genitive form of the adjective "the most characterisitc," meaning "of the most characteristic" (27 letters). However, according to Michal Marcin Wozniak the longest word in Polish is konstantynopolitańczyk�wianeczka (32 characters). It is the diminutive of the word "konstantynoplitańczyk�wianka." The second one means: "an unmarried daughter of a man living in Constantinople." According to 1996 Guinness, the longest Dutch word is KINDERCARNAVALSOPTOCHTVOORBEREIDINGSWERKZAAMHEDEN (49 letters, preparation activities for a children's carnival procession," or literally, "for children Carnival procession preparation activities"). ZANDZEEPSODEMINERAALWATERSTEENSTRALEN (37 letters, to "take a hike" or to "p*** off") appeared in a book by Herman Brusselmans, a (Flemish) Belgian writer, who writes in Dutch. There is also WAPENSTILSTANDSONDERHANDELINGEN (31 letters, "cease-fire negotions" or "truce negotiations") [Richard Eisenberger, John Slegers, René Davids]. Philip Bennett writes, "The longest (non-hyphenated) Gaelic word I know of is BEARRADAIREACHD (15 letters), which means 'clipping, shaving or pruning.' The longest (hyphenated) Gaelic word I know of is CRUIMH-SHIONNACHAIN (18 letters), which is 'a glowworm.'" According to a reader of this page, the longest word in Malay (called "Bahasa Melayu" in Malay) may be DIKETIDAKNYAHCASDIVERSIFIKASIELEKTROSTATIKKAN (45 letters), which means "has been undiversified of uncharged electrostatic electricity." There are also MENYETIDAKNYAHCASDIVERSIFIKASIELEKTROSTATIKKAN (46 letters), meaning "to undiversify uncharged electrostatic electricity" and PENYETIDAKNYAHCASDIVERSIFIKASIELEKTROSTATIKKAN (46 letters) meaning, "the process of undiversifiying uncharged electrostatic electricity." However, the latter two are no longer the widely used spellings. In Japanese, the longest word is CHI-N-CHI-KU-RI-N (12 letters) a very short person (slang), according to 1996 Guinness. However, Ben Rudiak-Gould writes, "I can't imagine why they'd think this. Right off the top of my head, BUTSURIGAKUSHA (physicist) is both longer and more commonly used. A look in the dictionary turned up OSHITSUKEGAMASHIKATTA (was forceful), which has the added virtue of being a native yamato word (as opposed to a Chinese loanword). If you're allowed to use implausibly complex verb conjugations, you can get things like UKETAMAWARASERARETAKATTA ("I wish I had been allowed to hear of it"). These weren't the result of any kind of systematic search. A native speaker could probably come up with better examples." The 1996 Guinness also has: "Patent applications sometimes harbor long compound words. An extreme example is one of 13 kana (Japanese syllabary), which transliterates to the 40-letter KYUKITSUROHEKIMENFUCHAKUNENRYOSEKISANRYO meaning 'the accumulated amount of fuel condensed on the wall face of the air intake passage.'" According to Takasugi Shinji, the longest native Japanese word is ry�g�nootohimenomotoyuinokirihazushi. Ben Rudiak-Gould writes, "It's not always clear what constitutes a word in Japanese, but I'm not convinced this qualifies. It's the name of a plant (eelgrass), and like other plant names it's often written in katakana, which makes it look like a single word. But it's really a multi-word phrase, ryuuguu no otohime no motoyui no kirihazushi, which means something like 'clippings of the hair-cord of the princess of the Dragon Palace' (said princess being an ocean-dwelling character from Japanese folklore)." Takasugi Shinji disagrees with this. He writes, "A reliable online Japanese dictionary says it is the longest plant name. A species name is a compound word, not a phrase consisting of several words, because it cannot be divided or reordered. Grammatically speaking, "forget-me-not" is a single word, so is "baby's breath." English speakers usually don't treat them as single words just because of hyphenation and spacing." In Icelandic, the longest word is HÆSTAR�TTARM�LAFLUTNINGSMAÐUR (29 letters, "Supreme Court barrister"). However, this web page gives a much longer possible word. In Hungarian, the longest word is megszentségteleníthetetlenségeskedéseitekért (44 letters), according to the 1996 Guinness. A translation is "for your constant mentioning of the fact that [a particular thing] is unprofanable." Ádám Szegi writes, "Since the publication of the above word, a new invention has been made. The basic word was modified and extended to another direction, leading to: legeslegmegszentségteleníttethetetlenebbeiteknek which means: "to those of you who can the very least be made profanized." This may be the current record in Hungarian with its 48 letters. This is not used in everyday Hungarian, of course. But there is another snake of word: változásbejelentésikérelem-benyújtási [kötelezettség] -- 37 letters which means: [obligation] "of filing an application to register a change" [of address etc.] This may occur in formal documents (though people usually don't dare to write down such a long word in one and will probably separate it with some spaces "to look better"). In theory, according to the orthography, this is a perfectly correct form, though they advise to possibly paraphrase expressions like that." In Mohawk, the longest word is TKANUHSTASRIHSANUHWE'TSRAAKSAHSRAKARATATTSRAYERI' (50 letters), "the praising of the evil of the liking of the finding of the house is right," according to 1996 Guinness. According to Johan Sydseter, the longest Norwegian word is Minoritetsb�rerdiffusjonskoeffisientsm�lingsapparatur (53 letters), "device for measuring the distance between atoms in crystalised substances." These Norwegian words have 27 letters: ARBEIDSTAKERORGANISASJONENE, KORREKTURLESINGSPROGRAMMENE, STATSTJENESTEMANNSKARTELLET, UNDERVISNINGSORGANISASJONER, and FOLKESUVERENITETSPRINSIPPET. In German, the longest word is DONAUDAMPFSCHIFFAHRTSELEKTRIZITAETENHAUPTBETRIEBSWERKBAUUNTERBEAMTENGESELLSCHAFT (80 letters), "the club for subordinate officials of the head office management of the Danube steamboat electrical services (name of a pre-war club in Vienna)," according to 1996 Guinness. According to Barbara Kratzin, in German the word would just have 79 letters, since ae would be written as Ä. A reader of this page writes, "There has been a 'Rechtschreibreform' in Germany recently which has changed the spelling of many words. I believe that there should be another "f" in Donaudampfschiffahrt.... It is now Donaudampfschifffahrt...." This word is an agglutinative. However, Paul Cooper writes, "The longest German word, quoted as Donaudampfschiffahrtselektrizitaetenhauptbetriebswerkbauunterbeamtengessellschaft, has the statement appended to it, that it can be spelled Donaudampfschifffahrtselektrizitaetenhauptbetriebswerkbauunterbeamtengessellschaft is wrong. The reform of the German language is only accepted by one Dictionary (Duden) and the spelling rules are now ignored by the government and all major newspapers, therefore the fff is likely to be incorrect." He also writes, "There is another long word in German, although its real status as a word cannot be correctly confirmed. The word is "Donaudampfschiffahrtsgesellschaftskapitaensfrauenverbandsvorsitzendenaufwandsentschaedigungsrahmenordnungsrichtlinienen" 119 and loosely means "The Danube Steam Navigation Company's Captain's wives federation for basic remuneration expenditure guidelines." It can also be spelled under the new spelling rules as "Donaudampfschifffahrtsgesellschaftskapitaensfrauenverbandsvorsitzendenaufwandsentschaedigungsrahmenordnungsrichtlinienen" with 120 letters. Hwever Peter Wyss writes, "The Danube Steam Navigation Company's Captain's wives federation for basic remuneration expenditure guidelines can also be spelled under the new spelling rules as "Donaudampfschifffahrtsgesellschaftskapitaensfrauenverbandsvorsitzendenaufwandsentschaedigungsrahmenordnungsrichtlinienen" with 120 letters. The last two letters should not be there. It should say 'Linien' not 'Linienen.'" Actually, Ausserordentlichhochgeschwindigkeitelectronenentwickelndesschwerarbeitsbeigollitron should be Ausserordentlichhochgeschwindigkeitselectronenentwickelndesschwerarbeitsbeigollitron, as the feminine ending -keit takes an -s when in combination form. So Time blew it again, I guess? As you can see, I am already at 45 letters, and could still go on with the waste paper basket company president's office carpet cleaners' uniform dry-cleaning corporation's hanger or some such foolishness. Of course, words such as these would be extremely rarely used and would not be found in any dictionary, but according to the rules of German, would be perfectly valid! According to Guinness, in German the longest dictionary word in everday usage is RECHTSSCHUTZVERSICHERUNGSGESELLSCHAFTEN (39 letters), "insurance companies which provide legal protection." A reader of this page writes, "There is no real 'longest word' in German, as speakers may make up grammatically correct words when needed." Steven Van Gemert writes, "I agree with this, and can give a somewhat specific example. When numbers are written in German, the individual words are concatenated together. Thus, the longest word would be the written form of an extremely large number. Considering that numbers can be infinitely large, then the largest word should theoretically have no limit. However, I am unsure as to whether there are even terms coined for such large numbers. For instance, in English you have "million", "billion", "trillion" and "quadrillion" (interpreted differently in America, yes, but all the same). If you were to think of a term to describe a number higher than that (even up to a "Googol" for instance), then I could ask you to name the term that is a thousand times the number you named. Eventually I think we would run out of terms to name the numbers with. Therefore, the longest word in German could theoretically be found with a little research since there would be a finite number of defined terms to describe the numbers. Unless of course you simply use "tausendtausendtausend" to indicate a thousand times a thousand times a thousand and so on. In which case I should like to submit that the longest German word would start with "siebentausendtausendtausendtausend...". :)"
Unfortunately, I consider some of the claims about the German language as dubious, at best. Firstly, anything starting with "Donaudampfschifffahrtsgesellschaft" tells every German, here we have another go at "long word." No one would take them seriously, and I've seen quite a few longer ones than the ones you've mentioned. "The reform of the German language is only accepted by one Dictionary (Duden) and the spelling rules are now ignored by the government and all major newspapers, therefore the fff is likely to be incorrect." The reformed spelling is "accepted" by all major dictionaries, and it is taught for quite a few years now. The old style of writing is admittedly still used by the major weekly news magazine (Der Spiegel), the major tabloid (Bild) and the major "regular newspaper" (Frankfurter Allgemeine Zeitung). This of course is legal, since spelling has no legal standing as a law. Still, the government as well as schools use the reformed spelling. So "fff" should be considered correct, even if you consider the old spelling the standard. Even more so, since the rule change responsible for this is one of only a very few that are actually not opposed by those opposing the new spelling, but which was acclaimed by all sides to be a very sensible change (before: when you had three same consonants in a row due to glueing words together, it would be written with three consonants if the next letter was a consonant as well "Balletttheater", but only with two, when the next letter was a vowel "Schiffahrt". Now it's 3 letters regardless.) and is used this way even by those who oppose the reform in general. Then again, "Donaudampfschiffahrts(...)gesellschaft" (please note: only 1 "s" in "gesellschaft") would be a proper name of a company, to which normal spelling rules would not apply at all. They could decide to change their name in such a situation, or to let it stay the same. If it weren't that all these "Gesellschaften" are entirely fictional. About German numbers: Those are not formed as claimed on your page. Up to a million, this is correct: 724537 would be "Siebenhundertvierundzwanzigtausendf�nfhundertsiebenunddrei�ig" but millions and higher values are not glued on, but rather separated: 157063724537 would become "Einhundertsiebenundf�nfzig Milliarden dreiundsechzig Millionen Siebenhundertvierundzwanzigtausendf�nfhundertsiebenunddrei�ig". And putting "tausend" in any place you like wouldn't work, eeither. And yes, Germans can form words as long as they like to. So we had the Rindfleischetikettierungs�berwachungsaufgaben�bertragungsgesetz as an actually suggested law (see German wikipedia). But we do not like that too much, the title of the law was changed, though it makes perfect sense to any German (after some digging through the word, it's not like we do this every day to this extent): "Law concerning how to assign the supervisional duties for labelling of beef products". In theory, a German word can be infinitely long. Germany's longest word - RINDFLEISCH-ETIKETTIERUNGSUBERWACHUNGSAUFGABEN-UBERTRAGUNGSGESETZ, the title of a law about beef - has ceased to exist. The word, which refers to the "law for the delegation of monitoring beef labelling", has been repealed by a regional parliament after the EU lifted a recommendation to carry out BSE tests on healthy cattle. The law was considered a legitimate word because it appeared in official texts. But it never actually appeared in dictionaries - compilers of the standard German dictionary Duden judge words for inclusion based on their frequency of use. In theory, a German word can be infinitely long. Unlike English, an extra concept can simply be added to the existing word indefinitely. At 80 letters, the longest Germon word ever composed is DONAUDAMPFSCHIFFFAHRTSELEKTRIZITATENHAUPTBETRIEBSWERKBAUUNTERBEAMTENGESELLSCHAFT, the "Association for Subordinate Officials of the Head Office Management of the Danube Steamboat Electrical Services". An interesting web page about long German words is at http://mentalfloss.com/article/54048/heres-how-crazy-long-german-words-are-made. In Swedish, the longest word is NORD�STERSJ�KUSTARTILLERIFLYGSPANINGSSIMULATORANL�GG-NINGSMATERIELUNDERH�LLSUPPF�LJNINGSSYSTEMDISKUSSIONS-INL�GGSF�RBEREDELSEARBETEN (130 letters), "preparatory work on the contribution to the discussion on the maintaining system of support of the material of the aviation survey simulator device within the north-east part of the coast artillery of the Baltic," according to 1996 Guinness. Fredrik Viklund found LÅGTRYCKSKVICKSILVERÅNGURLADDNINGSANORDNING in a Swedish patent application from approximately 1910-1930. It referred to what is now called a "lysrör" in common language. It means "Low pressure quicksilver vapour discharge apparatus." According to Ville Koskivaara, the longest word in Finnish is ep�j�rjestelm�llistytt�m�tt�myydell�ns�k��n, which he says means roughly "even with its quality of not being possible to be made irrational." Tuomas Rannikko suggests the alternate translation "not even when taking into account his/her/its way/ability/tendency of not disorganizing." He also writes, "I have also seen alternative spelling of ep�j�rjestelm�llistytt�m�tt�myydell��ns�k��n, but I cannot discern which is correct (Or they both might just as well be correct.) While AFAIK it is the longest non-compound (a single word, not a word made by concatenating many words together) word in Finnish language it's not the longest word. Compound words can be longer, and of course medical terms (which I hardly consider words in any given language, except for medical language itself) are long and also used throughout the world, regardless of the language they're wrapped into. The longest compound Finnish word I can think of right now is kaksitariffikolmivaihevaihtovirtakilowattituntimittari which is something along the lines of "dual-tariff tri-stage AC kWh meter" Then, if one adds a similar ending to the word as with the ep�j�rjestelm�llistytt��, it would become kaksitariffikolmivaihevaihtovirtakilowattituntimittarillaansakaan which is 'not even with his/her/its dual-tariff ...'"
Ville Koskivaara writes, "The spelling ep�j�rjestelm�llistytt�m�tt�myydell��ns�k��n suggested by Tuomas Rannikko is incorrect. One can say a) ep�j�rjestelm�llistytt�m�tt�myydell��n or b) ep�j�rjestelm�llistytt�m�tt�myydell�ns�, but one can never say c) ep�j�rjestelm�llistytt�m�tt�myydell��ns�. The options a) and b) mean the same thing, option c) does not exist in Finnish." According to Fotis Papanicolaou, in Greek, two long words in common use are SKOULIKOFAGOMIRMIGOTRIPA (an ant eating worm's lair) and LEMONOPORTOKALOMANTARINOFLOUDA (citrus fruit skin). However, Tsompanidis Vassilis writes, "These two are made-up words that do not actually mean anything. They are only used as examples of long words. For example the second one 'means' "skin of a lemon-orange-sanguine.'" Shouldn't Ausserordentlichhochgeschwindigkeitelectronenentwickelndesschwerabeitsbeigollitron [Time, March 13] read Ausserordentlichhochgeschwindigkeitelectronenentwickelndesschwerarbeitsbeigollitron? Yes, as Time's Los Angeles and Philadelphia (but not Chicago) printers had it.—Ed. According to Charles Turner, who supplied this information, Rev. Hesburgh has pointed out the need for an 'r' in the 18th position from the end of this German "word." According to Red Skelton, the longest word is the word that follows the announcement, “And now a word from our sponsor”!